Hi! 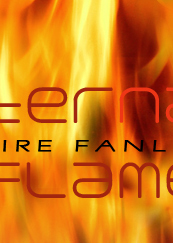 Welcome to "Eternal Flame", the TFL approved fanlisting for Fire, my favourite element! I always saw that this is the element the better describes myself, so I'm so proud to be its owner! Fire is the king of the elements, it's immortal and the highest expression of nature. Different ideologies conceive it as creation or destruction. An example is that fire is flames that can destruct everything, another one is that fire is purification. Not just purification of the body, but of the soul. We can interpretate it as our we can feel it in our heart. A very special thanks to the sweet Selene, the previous owner of the fanlisting, that handled me the complete members list! Also, a big thank to the kind Jen too, that made it possible! Please, choose a link from above to fully access the site, and if you're a fan of Fire, feel free to join its fandom! Layout & contents © Dorothy. Do not reprocuce.